A traditional Shellac Burn-In (hot melt) Stick made from the finest shellacs and resins. Ideal for use on older shellac finishes and for fine antique repairs. Used for chip, dent, and hole repairs on wood, stone, & marble. Accepts any type of topcoat, low heat will not lift or swell the repair. STICK Shellacs ('hot melt sticks') are made from select shellacs and resins. Stick Shellac is the classic adhesive for woodwind pad installation. Some musicians find a more favorable tonal quality as a result of using Stick Shellac, and the firm, defined tactile response on key closure with the harder shellac as compared to more pliable thermoplastic adhesives. The #14 Medium Amber is made to blend with tan leather pads. This adhesive formula is manufactured specifically for instrument repairs. in production throughout the finish maintenance and repair industry. The high-temperature element core assures top performance in the field or shop. 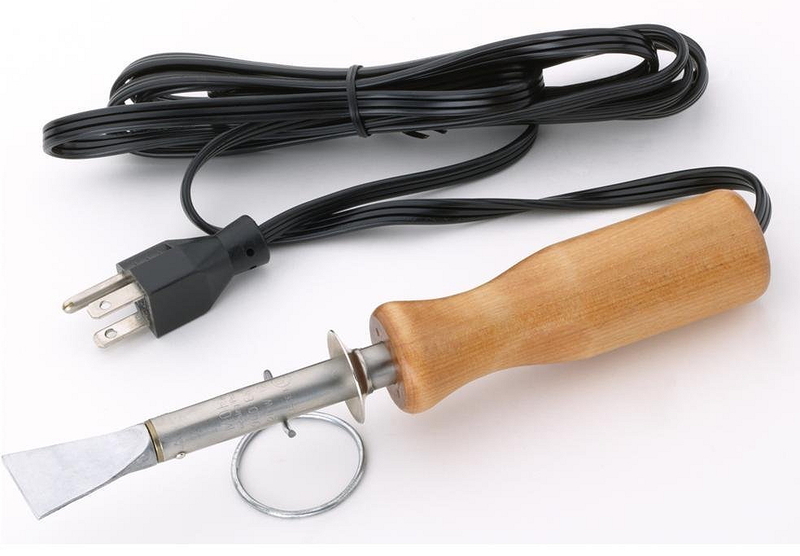 easy grip wooden handle, with a 3-conductor extra flexible cord. 6 foot neoprene power cord. - - UL listed, 25W, wt. 8 oz. ••• 3 conductor cord Without Plug. Supply a 220 Volt plug to match your electric system. for the BEHLEN Electric Burn-In Knife. Fits 110 or 220 Volt knife. Efficiently heats the manual Burn-In knives. maintains a constant 700° - 800º F temperature. Insert knives at both ends. 120 units are equipped with 3-wire grounded circuits with 15amp, 125 Volt plug. 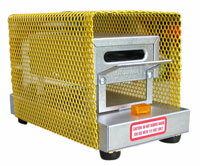 Durable all metal construction with knife handle guard and Safety Cage. Includes a pilot light. Efficiently heats the manual Burn-In knives. Insert knifes from both ends. Heats knives quickly - heater maintains a constant 700° - 800º F temperature. No Plug - Supply a plug to match your 220 Volt electrical system. Wiring Diagram included. The fishtail knife is an excellent general purpose knife. The narrow shaft of the blade allows good vision of the repair area. Use in Pairs; Rotate knives so one is always in the oven and ready for use. The B900 is the 'workhorse' for larger repairs on flat surfaces. The thick blade holds heat for extended periods of time. This beveled knife edge is used for fine details and inserting grain detail into burn-in repairs. Super stainless steel curved rigid blade with a rosewood handle. 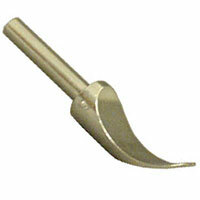 Very useful tool for carvings and curved or fluted surfaces.